Fire pits are a must have item in every designer garden they give you a focal point to be drawn to and an area to congregate with friends making the garden a year round useable space in the home. When selecting a location for your new fire pit make sure you place it in an area where no plant canopy will be damaged by the heat of the fire. You’ll need good ventilation but try to retain a cosy intimate space. Your fire pit area will spend the majority of its time without a fire in it so make sure you design a space that looks great with or without a flame. My preference is for a wood burning fuel fire but if you simply dont have the room for real fire you can use a gas or ethanol burner to give the effect of real fire but without the mess and inconvenience of chopping wood. The material you use for your fire receptacle can be steel or stone. With stone make sure when it heats up it doesn’t split or burst and if using metal be warned when it rusts it can stain the flooring beneath. You’ll need to define your area and paving is a great way to do that. 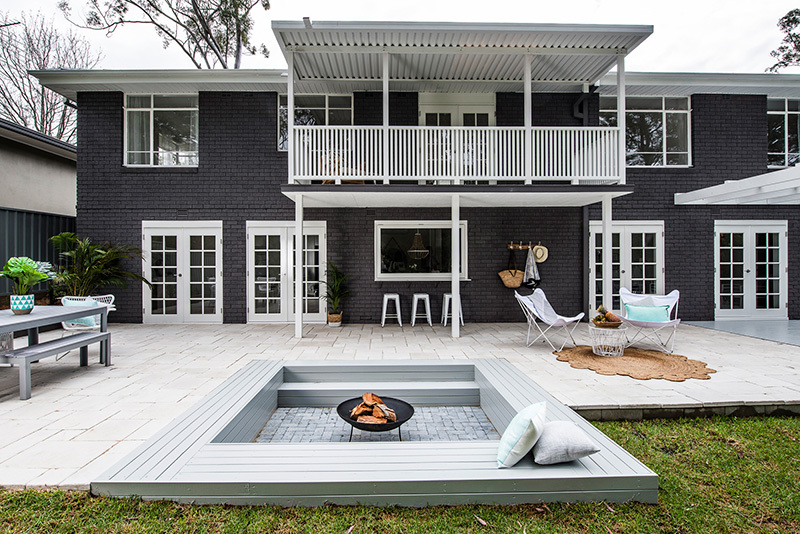 Select a style and colour that not only suits the style of the fire pit but the garden as well, that way your area wont feel like an after thought. I feel lighting a fire is such a rustic natural experience that natural stone paving suits best. I love Ambers tumbled bluestone brick format pavers as they add a modern twist to a rustic material but also a tumbled limestone and sandstone would also work well. There is no point having a fire pit without some seating around it to enjoy it so make sure you have something comfortable and in keeping with your garden style. This can be a simple as some timber stools or more structured with built in seating. Lighting may seem like a waste when your about to have a fire but some low level ambient light is a great way to make the area more practical and add some atmosphere to the surrounds of the main feature. Put your fire pit lighting on a separate circuit to the rest of your lighting so you can have it working independently from the rest of the lights for versatility. Always have at hand the means to put it out your fire as you’ll never know when you might need it a bucket of sand or a hose is ideal.